My colleague skyped me yesterday saying: “Just decided to watch TV for the first time in 2 months. Guess what was the first thing I’ve seen right away?” I replied: “Something about blockchain?” and received a laughing out loud smile as her consent sign. However, it wasn’t a hard guess for me as we’ve been discussing blockchain all day through at the office. The year 2017 is over, and no notion in the world got more hype than blockchain and cryptocurrencies. At the same time, there’s a certain amount of incertitude among the general public. For instance, some people consider bitcoin a controversial currency used only for criminal black market activities. 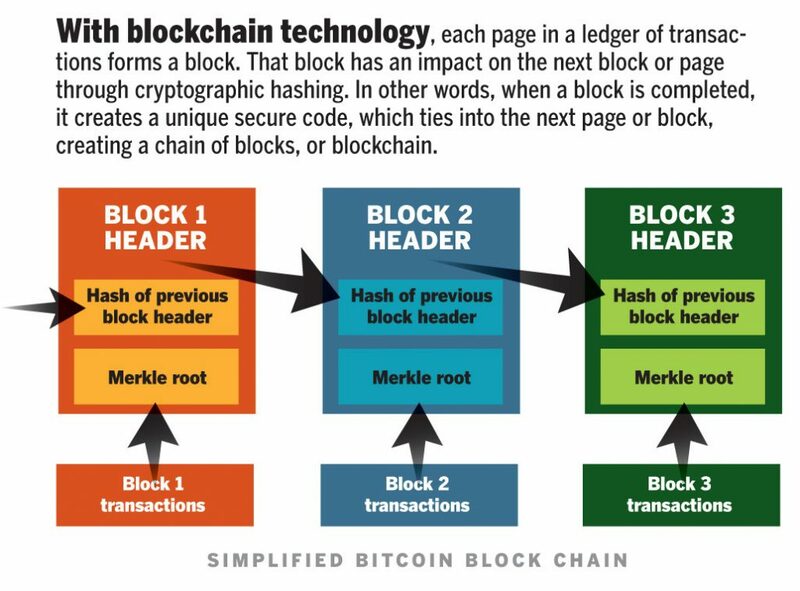 The other still confuse the blockchain with bitcoin and vice versa. Like any other innovation, the blockchain technology is yet to be fully understood and adopted. What is blockchain anyway? To keep a long story short, a blockchain is a sort of ledger that businesses use to track credits and debits. You may ask yourself: “What’s the innovation then?”. It lies in one of the blockchain’s main features that links (or “chains”, we’re after blockchain, aren’t we?) cryptographically verified transactions into sequences of lists (aka “blocks”). The method of linking different blocks of data together is called “distributed consensus”. Multiple entities within the blockchain network agree that the records within each dataset are true by checking cryptographic algorithms (“hashing”). The blockchain technology assures data integrity, maintains auditable records, and even turns regular financial contracts into software – so-called “smart contracts”. Business analysts across industries indicate that 2017 was the year, when the blockchain technology has finally made a step forward. Let’s see what events among others have contributed to this statement. 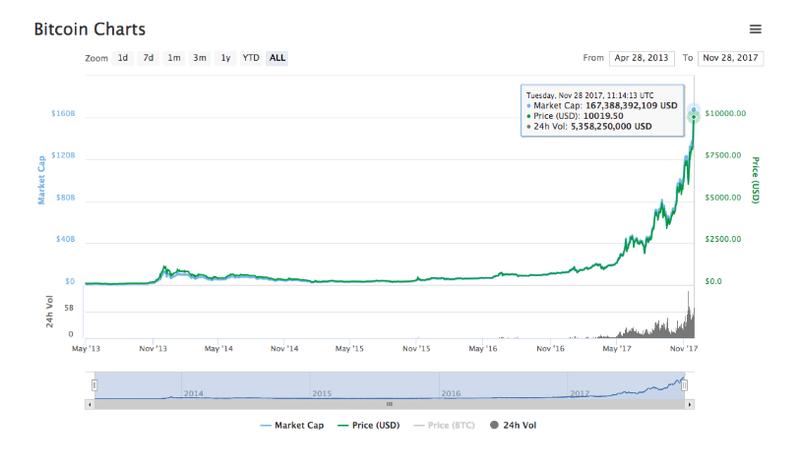 On November 28, bitcoin crossed the $10,000 mark. The price of the most popular cryptocurrency reached $10,032, according to stats from Coin Market Cap. A cryptocurrency startup IOTA has partnered with Microsoft, Fujitsu, and twenty more companies to launch the first publicly accessible data marketplace for the Internet of Things. The marketplace will be entirely powered by blockchain. Fortune magazine has published an annual rating of 40 Under 40, picking the most influential people under 40 years in the world of business. While the first place in the rating was taken by French President Emmanuel Macron, Ethereum’s founder Vitalik Buterin, 23 and Coinbase CEO Brian Armstrong, 34 divided the laurels, both taking the 10th place. On November 15, 2017, Uport has made a self-sovereign identity and user-centric data platform on the Etherium blockhain avaliable to the citizens of Zug, Switzerland. Moreover, the first ever official identification was registered on the blockchain before a live audience. As of September 2017, this Swiss town will offer all of its citizens a digital identity on the Ethereum blockchain. With all that hype around the blockchain, expectations from businesses have never been higher. IBM forecasts that by 2020, two-thirds of banking organizations will be using blockchain-based apps. For instance, back in 2016, the Bank of America announced a partnership with Microsoft to explore the potential of this technology. Sure enough, the blockchain’s very first applications may serve the banking sphere, however, it’s not the general rule. As repeated many times, if an enterprise wants to keep up with the pace of the market, it must be flexible and adopt new technologies. Let’s face it: chances are that businesses who don’t adapt to the decentralized future world might become businesses of the past. So let’s discuss some practical blockchain applications for your business. A regular “brick and mortar” contract is a set of pages enlisting the terms and conditions of a certain deal. When a party violates the obligations mentioned in the contract, it usually results in a breach of contract or lawsuit — but this can result in an expensive and time-consuming process. Smart contracts change that. The term ‘smart contract’ (or self-executing contracts, blockchain contracts, or digital contracts) has been known since the 90ies, but it walked into the spotlight only in 2013, thanks to the release of the Ethereum Project. In this format, contracts represent a computer code, which is stored and replicated on the system with further supervision by the network of blockhain-run computers. Chris DeRose explains on American Banker that ‘smart contracts’ are “self-automated computer programs that can carry out the terms of any contract.” But we like the definition by Blockgeeks: “The best way to describe smart contracts is to compare the technology to a vending machine. Ordinarily, you would go to a lawyer or a notary, pay them, and wait while you get the document. With smart contracts, you simply drop a bitcoin into the vending machine (i.e. ledger), and your escrow, driver’s license, or whatever drops into your account. More so, smart contracts not only define the rules and penalties around an agreement in the same way that a traditional contract does, but also automatically enforce those obligations”. Yes, these contracts are non-breakable. One of the greatest blockchain’s features is the capability to get rid of middlemen while doing business. Sure, Uber or Airbnb may have brought a new business model we all like, but they take their share. The blockchain can bring changes as well. Arcade City, for example, is a new ride-sharing app that connects drivers with customers peer-to-peer using the Ethereum blockchain. Arcade City’s founder, Christopher David, says that “by decentralizing the system, Arcade City makes the driver to be an entrepreneur, and empowers the rider with control over their entire experience. Both drivers and riders are loving it so far.” By the way, in May 2017, Arcade City came first in the blockchain startup category at the GTEC Awards in Berlin. Today, cyber security is a major topic, considering all the resonant news like Apple’s iOS encryption dispute with the FBI or attacks on NASA’s website. Major data breaches, bank heists, account hijacking, hacktivism, DDoS attacks – the list of dangers is huge. The blockchain confronts the fundamental flaws of security by taking away the human factor from the process, which is usually the tender spot of security. The blockchain’s security potential is so huge that even such organizations as Pentagon are thinking about using this technology as the cybersecurity shield. This way the data is less vulnerable to being hacked or changed without authorization. However, the blockchain security applications are in their early days, so there have been several hacks in recent months. This is something that future applications will need to grow up to. But in the end the technology behind it is versatile and incredibly useful for the secure future of the Internet. In process of time loyalty programs have become much more complex, difficult to use and less transparent. For instance, customers often don’t understand why some purchases earn more points than others. The blockchain technology is a perfect solution for companies that offer loyalty programs and gift cards. Thanks to the blockchain’s advanced verification possibilities, the business process becomes cheaper and much more secure. It’s easy to monitor activity, track liabilities and sales, set limits and regulate employees access to key treasury functions. Blockchain’s continued evolution demonstrates that the technology is only beginning to show its full potential.To stay updated on the blockchain news, here’s the list of top 10 upcoming blockchain events/conferences. Such events are the perfect opportunity to meet industry leaders in person, exchange ideas and discuss the latest trends. The blockchain is a new technology, and its adoption remains the biggest challenge for businesses. However, companies shouldn’t be encouraged by a few collisions, which may happen along the process of figuring up how the technology works, and they shouldn’t expect the proof of concept to appear right away. Here at Elinext, we work with our clients to select the ideal blockchain development solution for their business needs. Contact us at [email protected] and let’s bring the benefits of blockchain technology to your organization.